I keep testing this deck and so far I'm really enjoying how it plays. I start by playing protection cards to prevent me from dying with no creatures on the field. The pillow fort doesn't draw much attention and I chill in the shadows of the other players. Then I have my fun collecting all the mana I could ever need. With the mana I then set up a win condition when nobody is looking by dropping a few mill cards and dumping upwards of 100 mana into them Increasing Confusion . When I started playing this deck I dropped the big creature or huge sorcery too soon and lost because I became the immediate target. The secret to this deck is patience, you have to avoid the urge to drop the 10/10 eldrazi Ulamog, the Ceaseless Hunger even though you are fully capable of doing it. Kruphix lets you wait with both an endless mana pool and endless hand, his real ability is secretly being able to plan and prepare. The problem with this deck is it relies on carefully knowing the political state of the board and being the least threatening for most of the early game. This means if someone for some reason chooses to end me early on with a faster aggro deck I would be toast. The reason it works though is because of the length of EDH games and the idea that there is always a bigger fish to worry about at a table of 3-4. From my experience of playing this deck the aggro decks that pose an early game threat get choked out by everyone else anyways. This is definitely dependent on your play group but for me the other opponents will manage the overly aggressive decks. Along with this I included the cards like Elephant Grass , Arboria , Collective Restraint , Energy Field , and Propaganda just in case I become the target of attacks. Another trick is waiting until the end of the last opponents turn before tapping out all your mana. With Kruphix keeping it after the turn ends you don't have to tap out at the end of your turn, you can wait until right before your next upkeep. This can convince people you have a counter spell while still allowing you to tap your mana from last turn right before your next turn. Cards like Awakening , Seedborn Muse , Urban Burgeoning , and Victory Chimes utilize my opponents turns to generate more mana as well. I would also appreciate any input if anyone has ideas or cards that would match the way this deck plays. Feel free to suggest anything in the comments, even music, that's cool too. If you think I should switch out cards in my main board for the cards in my sideboard let me know too. So I have decided to return to this deck because out of all the EDH decks I made this is by far my favorite to play. Here is the updates to date. This is because Riddlekeeper was causing graveyard strategies to work for my opponents. He seemed to make other people want to attack me more which is the opposite of what I wanted from my homunculus buddy. He is being replaced by an overall mad lad of a card Rite of Replication. What's better than 1 Darksteel Colossus? You guessed it, 5. This deck tries to avoid appearing threatening early on and an Eldrazi named Endbringer brought a lot of negative attention to me. Endbringer also didn't do much for me and always felt like a waste of mana. To replace our scary friend is the wonderful disk of destruction. I categorize this as protection because I can use the tap ability as a threat to anyone wanting to attack me. 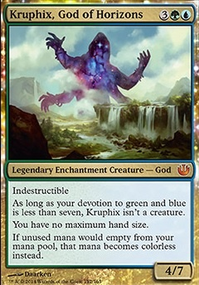 The bonus of this card is that Kruphix is indestructible meaning I can wipe everything except my large mana pool and big God pal Kruphix. I can't wait to say "attack me and I'll destroy everything, your choice". It also plays a big part in winning because I can clear the board and then drop an Eldrazi to clean up what's left. This is just better ramp opportunity. Resonance was slow and really only gave me 5 mana a turn at best, it was also only at a specific time. Mechanized Production produces tokens that stay on the field and build an army of ramp that I can tap whenever. Also not to mention Mechanized Production can copy Doubling Cube which means every turn I can double an extra time. Web of Inertia really only works in the first 4 turns, as the game progresses people can pay the cost without blinking and it didn't provide me much security. The card replacing it is a big scary bomb that might go off if someone decides to attack me. Just like Nevinyrral's Disk it has more power when it comes to convincing people not to attack. Again this decision is just based on better ramp and interaction capabilities. Gilded Lotus can be the target of Mechanized Production, Works with Mana Reflections, untaps with Seedborn Muse, untaps with Awakening, and provides blue mana if I need a quick counter spell. Versatility in my opinion is better than the stagnant 2 green mana each main phase that Siege gives. I thought with all the ramp I run 36 lands might be fine, and I got to add an extra card. I felt I was a little low on protection so I wanted to introduce the most annoying protection card around. I have no idea how I forgot about this bad boy but I've heard rumors it's made games last 3-4 hours. Hopefully people will feel like they are wasting their time attacking me if I just keep causing a big old fog storm.